While passenger service on the H&F ended over 70 years ago, many remnants and landmarks can be found throughout the region to this day. More detailed locations for the below locations as well as other points of interest can be found on our Interactive Map. Of all the pieces of equipment which operated over the Hagerstown & Frederick Railway and its predecessors, only four “trolleys” are known to still exist. No other pieces of rolling stock are known to exist although several had survived into the 1990s, emphasizing the need for the care and support of these survivors. Built: 1920 Purchased: 1920 Builder: Hagerstown & Frederick Railway Co. Appearing to be based on the design of the J.G. Brill Co. built #6 but with a length nearly ten feet longer, Freight Motor #5 was built in the Frederick Shops and served throughout the system from 1920 until replacement by diesel locomotives in 1955. It served as an agricultural shed before becoming a part of the Rockhill Trolley Museum collection. The HFRHS acquired the car from that museum and in turn donated it to the Town of Thurmont. In 2017 the Society provided the Town with paint suggestions leading to the current accurate appearance. Built: 1918 Purchased: 1923 Builder: Southern Car Co. 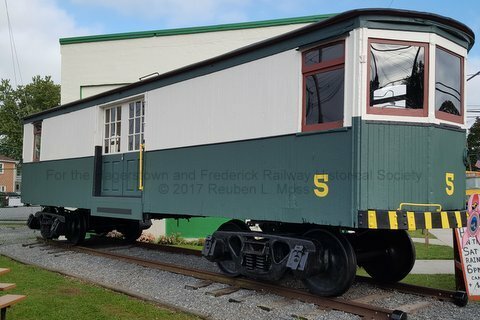 Built for the Columbia Street Railway to serve Camp Jackson SC during the first world war, Car 150 along with three identical cars were purchased by the H&F as surplus in 1923. From that year until 1938 the four cars were primarily seen traveling between Hagerstown, Funkstown and Boonsboro. When those services ended in 1938 the cars were sold to be used as restaurants. 150 eventually became part of a cabin on Catoctin Mountain before being purchased by Donald Easterday and moved to Myersville. Mr. Easterday restored the car and hosted a Trolley themed fall festival on his property from 1993 to 2011. In 2017 the Town of Myersville has purchased the car from the Easterday family and is currently renovating the car to be on public display inside the town library which is scheduled to open in 2019. Built: 1917 Purchased: 1917 Builder: J.G. Brill Co.
Hagerstown trolley service was devistated in 1917 when a fire destroyed the carbarn and all of the streetcars and interurbans inside. One of the victims of this fire was a wood bodied Brill interurban numbered 168. The company quickly ordered replacement cars and recieved this replacement #168. This car was the first steel-sided trolley in the system and frequently traveled both the main line to Frederick and the Williamsport branch. 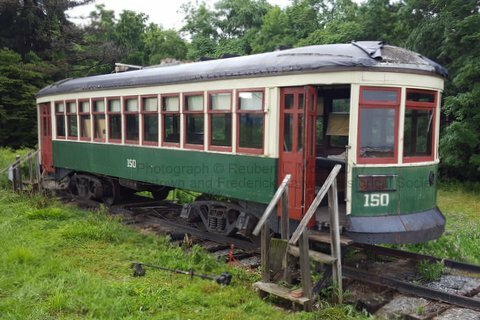 It was one of three cars involved in the Last Trolley trip to Williamsport on August 4, 1947. After retirement the car was moved alongside the Potomac River where it served as a cabin until the 1970s. It was acquired by a model railroad club and sat outside the Hagerstown Fairgrounds for many years before being moved to its present home and donated to the Hagerstown Roundhouse Museum. The museum hopes to restore the car in the coming years, and is currently accepting donations toward the car’s care. Built: 1921 Purchased: 1921 Builder: J.G. Brill Co.
One of the last two cars purchased new by the Hagerstown & Frederick Railway, #171 was one of the most often photographed cars in the system. 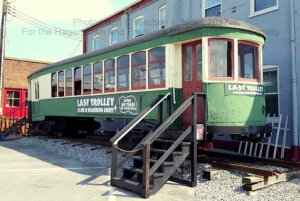 Like the other combines it served the main line between Hagerstown and Frederick, however it is best known for its survival as one of the last two Interurban trolley cars to operate in the state of Maryland when the service ended on February 20, 1954. 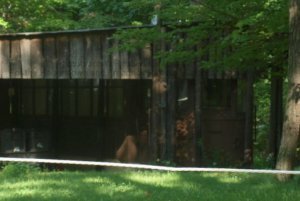 It was sold and has been used as a fishing cabin near Thurmont to this day, protected under a solid roof. Many buildings and structures contributed to the Hagerstown and Frederick Railway infrastructure. These are the survivors. This structure was part of the 1910 Frederick Railroad infrastructure improvement program and was built to replace a wooden carbarn that had once stood along Carroll Street. 6 tracks entered the front of this structure which allowed for repairs and inspection of the trolleys and indoor storage when not in use. In the last years of Trolley service the tracks were removed and the building was used to store and inspect Blue Ridge and other Potomac Edison owned busses. 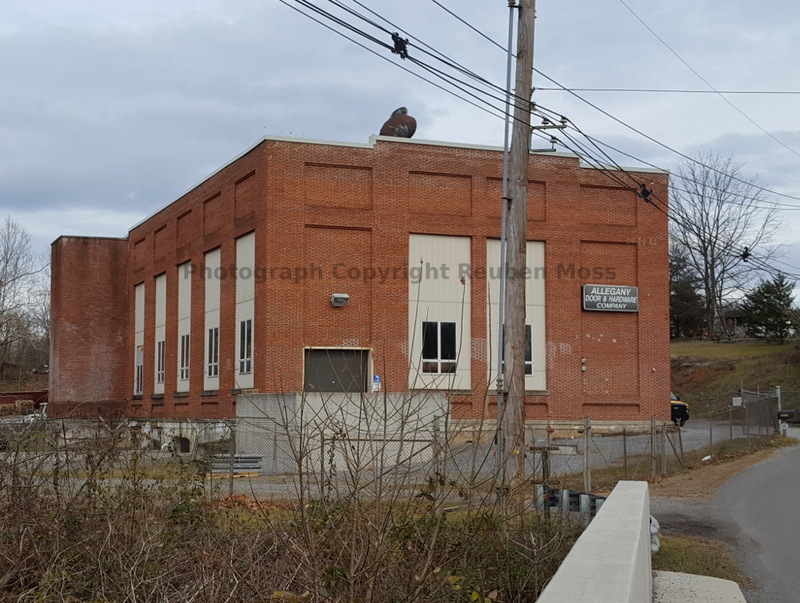 Today Potomac Edison continues to use the carbarn as a storage warehouse and has constructed a more modern office structure onto the front side of the building. It and the surrounding railroad yard site now serve as maintenance crew administration and storage. 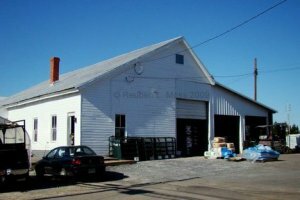 A part of the Frederick Shops & Yard complex, this building is where the H&F cars were repainted. Two tracks entered the back of the building and traveled the length of the block structure. 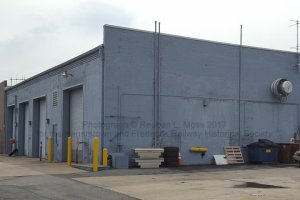 Today Potomac Edison uses the structure as a maintenance shop for company repair trucks. The trolley doors have been bricked closed and four doors have been added to the side for vehicular access. 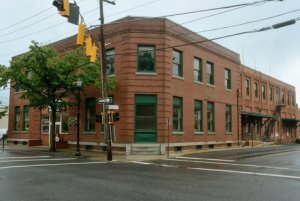 As Hagerstown service grew, the Williamsport power plant could not provide enough electricity and this structure was built at the intersection of Summit and Lee streets to generate more power. 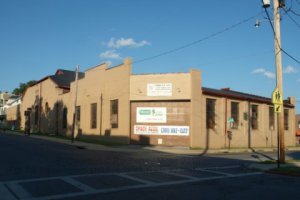 After the original carbarn at Summit Ave. & Howard St. burned in 1917 and with the existance of a newer plant at Security north of Hagerstown, this structure was modified to serve as the storage, maintenance and inspection building for the trolleys. Originally half its current size, the small yard leading out of the building was later enclosed. In later years trolleys and busses shared the building. Today it is privately owned and houses several businesses. One inspection pit as well as a part of the washing station and the office area still remain intact inside the building. 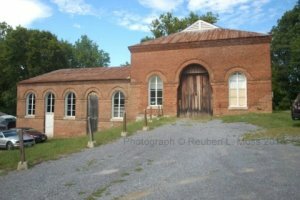 Intended to provide power for the Hagerstown Railway system, this structure was built along the Conococheague Creek where access to water from the creek and coal from the canal and Western Maryland Railway would be easily accessed. It is not believed that trolley cars ever entered the structure. Today it is owned by the National Park Service and contains canal related exhibits and storage. The jewel of Frederick Railroad’s 1910 infrastructure investments, this structure served as the main offices of the company into the 1960s. When constructed, a track entered the building from the Patrick Street side of the building and traveled through the center of the station and alongside a fully enclosed freight warehouse. Doors lining the Carroll Street side of the building allowed wagons and later trucks to back up to this warehouse platform for ease of loading and unloading. Frederick and Frederick-bound trolleys met at this building until Patrick Street became one-way in 1948. For several decades this building was re-purposed as the home of Frederick’s News-Post newspaper. It is slated to again be re-purposed to become a restaurant and several retail/office spaces in coming years as part of the planned Downtown Frederick Hotel project. 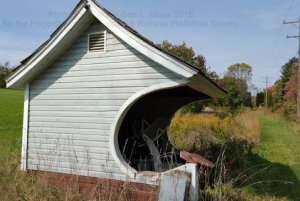 The storage shed for the Summers Co-Op in Jefferson was once an H&F trolley station! At one time, the track passed right through the first, largest door. The back two doors were added recently. For a short period of time the local trolley system was operated by investors from Baltimore. During this period a branch line was constructed from Braddock Heights to the small town of Jefferson with the intention of continuing the line to the Railroad and Canal town of Brunswick. The line was never completed past this building which served as the freight and passenger station until the line was closed in the 1930s. Today, local feed store H.C. Summers uses the building for storage and the waiting room contains a small art boutique called Main Street Trolley. One of two stations in Braddock Heights (the other being a glorified shelter closer to the National Pike) this building served as the station and post office for the town proper, as well as a convenience store and power substation for converting AC Power sent from the power plants into DC electric which powered the trolleys. For many riders this building was the gateway to the Braddock Heights Amuseument Park which had been constructed and operated by the trolley company from 1901 into the 1950s. 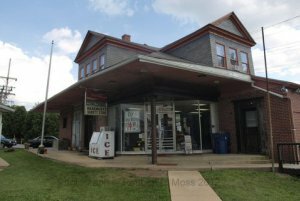 Today the storefront remains open as a convenience and liquor store, however the post office and substation have been converted into an apartment. It is the last surviving structure related to the company’s amusement park. Believed to be the shelter which once stood on Main Street near Schoolhouse Drive in Middletown, this shelter was auctioned and purchased by a farmer who used it for several years to store straw. Donald Easterday of Myersville purchased the shelter and moved it onto his Trolley Festival grounds in the 1990s where it still stands. Shelters in this style are also known to have existed at Montevue north of Frederick and Clifton between Braddock Heights and Frederick. In 1919 a fire destroyed the original trolley station and several businesses and structures in Myersville. This brick structure was constructed containing a general store, with the right wing being used as the passenger station for the H&F. A freight warehouse was constructed beside the passenger section. After 1938 this served as the terminus for Frederick County trolley service as the line connecting to the rest of the system in Washington County was removed that year. Today the building has gained a second floor and modern roof. At present the structure contains several apartments. The site of the freight warehouse now holds a public park. 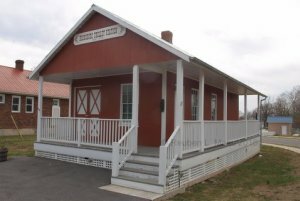 This building served as the terminus of the Boonsboro branch. It is the last purpose-built station in Washington County. It became a storage warehouse for many years. Trolleys leaving Hagerstown to the north terminated where the parking lot for this building can now be found in the small town of Shady Grove, Pennsylvania. 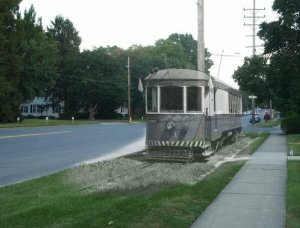 It was here that Chambersburg, Greencastle & Waynesboro trolleys (which also traveled to Penn-Mar Park as well as the three namesake communities) which traveled the center of the street would stop to exchange passengers with the Hagerstown cars. The H&F was standard gauge while the CG&W was a wider gauge, so trolleys could not travel between the two lines. This building was a store and waiting area for trolleys. Another structure stood nearby which may have been the actual ticket office. 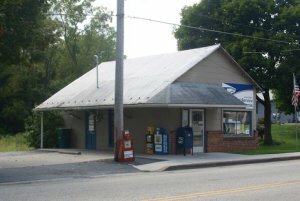 Today the station-looking store is the community’s post office. 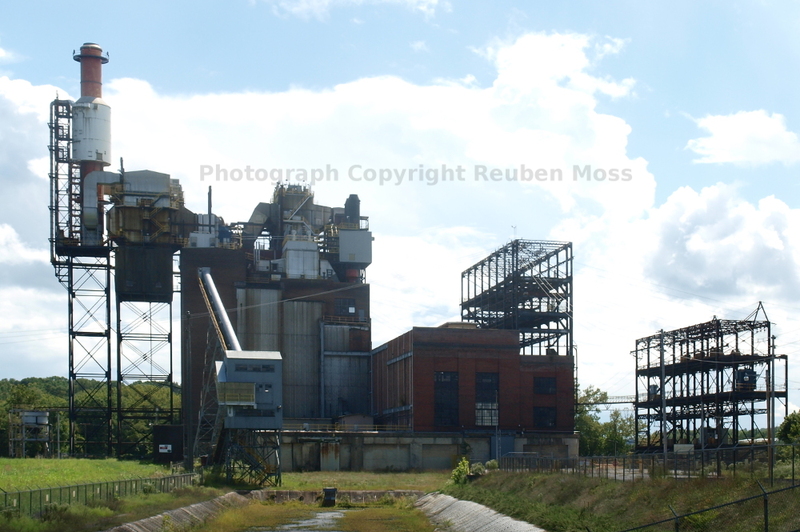 The first Hagerstown and Frederick Railway Power Plant designed specifically to provide power to homes and businesses as a primary utility rather than a side business for the trolley service. This plant allowed the company’s customer base expand beyond the railroad’s service area. 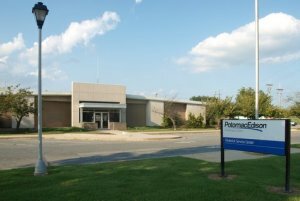 Construction on this plant began around the time the company renamed itself from The Hagerstown and Frederick Railway to The Potomac Public Service Company, in a time when the C&O Canal was still in operation. It served under the Potomac Edison and later Allegheny Power names into the 1990s. A Right of Way is the property set aside for travel. In the case of rail services it is a narrow property that can cross through other properties, often wide enough for the track with some space on each side. In the case of the H&F, several portion of the Right of Way have been sold back to private land owners and returned to farmland. Despite these sales and the removal of the tracks themselves over half a century ago there are many portions of the line that are still visible. Along Main Street in Middletown. Rosemont Avenue near Hood College in Frederick. Beaver Creek – Between Mapleville Rd. and Cool Hollow Rd. Boonsboro – along Main Street between Mapleville Rd. and Park Ln. 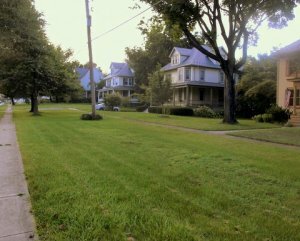 Braddock Heights – Along Maryland Avenue. Frederick – Rosemont Avenue from Hood College to Culler Avenue. 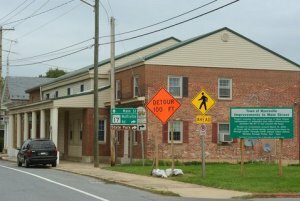 Middletown – Along Main Street between Pine Rd. and Broad Street. In many other areas, residential driveways end prior to the roadway and the trolley right-of-way is now used for parking, however this is not as clearly evident a sign of the route. Additionally, the grassy median between the lanes of Wilson Boulevard in Hagerstown dates back to the days when trolleys traveled along that median on the tracks that have since been replaced by street lamps. 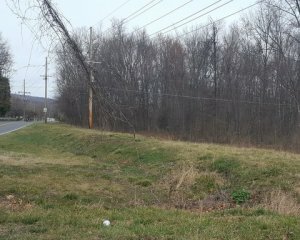 The above image shows how erosion has filled in what had once been a deeper cut nearing Braddock Heights. 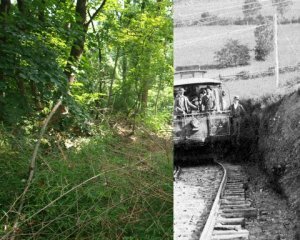 In a few locations the Hagerstown & Frederick’s predecessors cut gaps in hills to allow smoother transitions and avoid steeper climbs up the mountains. While erosion has smoothed these locations over time and most are not in easily accessible locations, several of these ‘cuts’ still exist. Most notable cuts include a hill at Rudy’s Hollow between Myersville and Middletown and a cut during the steep climb to Braddock Heights, both of which cannot be easily viewed from public property. 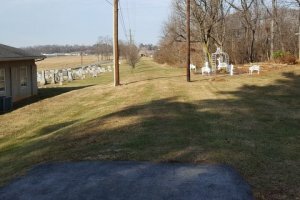 A much smaller cut can be found as an indentation in a yard at the intersection of Beaver Creek Road and Childacress Drive in Washington County. 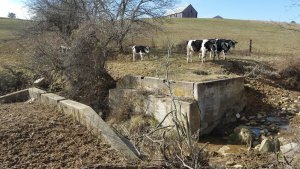 The remains of a small stream crossing, now within farm pasture near Myersville. 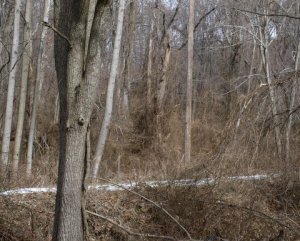 In many areas, especially along the Thurmont – Frederick route and in the Myersville area, culverts and the remains of bridges are still readily visible from public places. In a few areas streets have been given names associated with the trolley service. 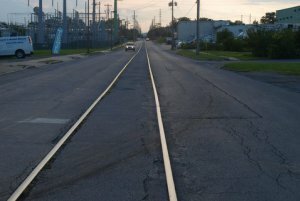 The most obvious are “Trolley Road” and “Old Trolley Lane” in Washington County, however the renaming of Telegraph Street to “Braddock Avenue” in Frederick and the name Jefferson Boulevard given to the road that was formed along the Jefferson branchline of the H&F hint to possibly having been influenced by the trolley routes they paralleled. The grade through Mt. Lena is one of the best preserved grades despite having been closed in 1938. The grade visible near Catoctin Furnace where the line once crossed Catoctin Furnace Rd. A portion of grade highlighted by light snow on South Mountain, near Rt. 40 and Crystal Falls Rd. Track down the center of 5th Street near Pine Avenue in Frederick. Portion realigned and some rail likely replaced by PRR in 1960s. S. Clifton Rd. near Flowing Springs Dr. Unnamed alley near Flowing Springs Dr. Along Alt. Rt 40 Ridge Rd to Dogwood Ln. Old Hagerstown Rd near Station Rd. Rt. 17 from Catoctin Creek to Ventrie Ct.
Canada Hill Rd. from Church Hill Rd. to Easterday Rd. Parallel Rt. 40 near Pleasant Walk Rd. Along creek and Rt. 40 near Crystal Falls Dr.
West of Cool Hollow Rd. between Rt. 40 and Beaver Creek Rd. Beaver Creek Rd. & Hebb Rd. Alt. Rt 40./Frederick St. between Antietam Creek and Kenly Ave.
Marsh Pike across from Victory Dr.
Farm field at Marsh Pike & Reidtown Rd. Leitersburg Rd. & Trolley Rd. McDowell Rd. – Now driveways near Gearhart Rd. Christopher’s Crossing near Whittier Dr.
Bethel Rd. near Crestview Dr.
Mountaindale Rd. near Stull Rd. Black Mills Rd. & Catoctin Furnace Rd. Kellys Store Rd. near Brice Rd. Mapleville Rd. west and parallel of road. Treeline near Sheetz. Mapleville Rd. east of road north of El Rancho Rd. In Addition, some former right-of-way in Frederick still has track, maintained by other railroads after 1961. 5th Street to Pine Avenue, once continued straight across East St.
South Street beside Southern States, once part of Grove Quarry branch. East Street, from Carroll Creek to above 5th Street was electrified and a track use agreement existed to run on PRR tracks from 1948-end of service. The least reliable method of identifying the trolley route is power lines. While some areas (as seen in the photograph near Lewistown shown left) can be verified as having been the route of the H&F tracks, other power lines have been relocated or replaced altogether and other power lines have been added over the years. Part of the Thurmont substation, and a reminder of the trolleys which once traveled between the two leftmost poles. 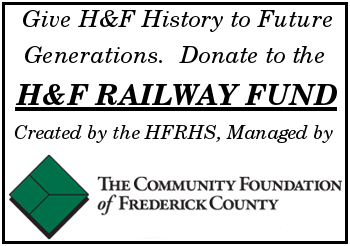 Even though the Hagerstown and Frederick Railway no longer connects communities throughout Frederick and Washington Counties with rail service, it has left a lasting impact on the region. The admired neighborhoods of Braddock Heights exist because of the construction of the line, while other small communities and small-town businesses that had been provided with rail service grew because of the connection. Perhaps the greatest impact can be found in local electrical services. Homes and businesses along the H&F were among the first in the area to receive electrical power. 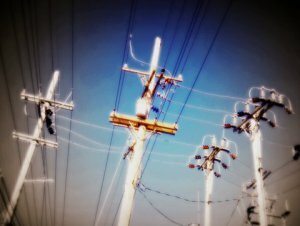 In many areas, the local feeder lines and substations that serve towns and the cities today are the same as those which once provided power to the trolley system (albeit upgraded over the years). 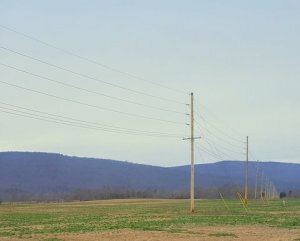 Even while the Potomac Edison power plants in Williamsport and Hagerstown no longer provide power for customers in four states, they are a reminder of a time when leaders of the company sought to develop a larger power network by acquiring smaller companies and connecting them in the years before the formation of the national power grid.